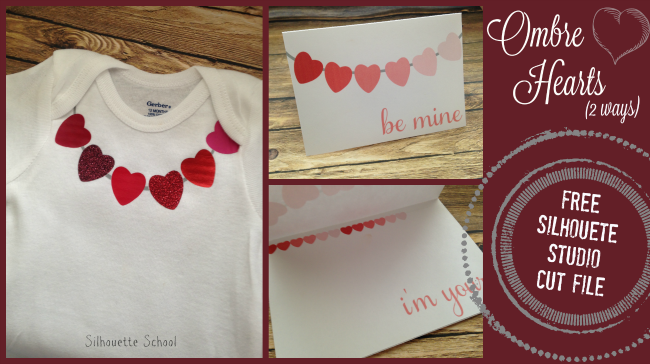 It's Freebie Friday at Silhouette School and this week I'm sharing an ombre heart design - two ways. The first design is created with a faux necklace design in mind (although it would work as bunting too with a few minor adjustments). The second uses the same basic design, but in a print and cut card form. For the sake of not making this file size too large, I did not give the hearts a solid fill in the design. (Fills and patterns inflate the file size and make them more difficult to share and re-open). To re-size the design to fit your shirt measure around the neck opening and then re-size the entire design focusing on where the top of the chain will hit. You want the distance between the chain openings to fit around the neck opening of the shirt. You can cut the hearts on all the same color HTV or on all different colors (at the same time) which is what I did. This is the perfect chance to raid your scrap drawer. The 'chain' shape is split where the hearts should be placed to avoid overlapping HTV. Press the chain piece on first. Next place every other heart heart into position making sure there are no gaps between the heart edge and the chain. Since the hearts are close together, you want to avoid pressing all the hearts at the same time or you risk overlapping and accidentally pressing the htv onto a piece of transfer material instead of the shirt. Repeat until all the hearts are pressed onto the shirt or onesie. Tip: You could make this easier on yourself and print and cut on printable htv and then iron on one piece. If you like the colors in the card and want to transfer them to the necklace, select one of the necklace hearts > click the Fill Color tool along the top tool bar > Use the eyedropper to color match the first heart from the card by clicking the heart > repeat for the ombre effect. The card is a simple print and cut. Add registration marks, print the design on your printer and then cut on Silhouette. If you need a refresher on print and cut, check out this Print and Cut beginners tutorial. Attach the inside piece with a few strips of double sided tape. Don't forget all Silhouette School free cut files are for personal use only...including these. That means they can't be sold in any manner. I am just curious, because I have had this happen to me. I felt like I was wasting vinyl, so I would put a box around designs to help with waste. But, even if I forget, sometimes I will cut the vinyl with scissors. In this case, the silver necklace part. Is this something that people do? After you download the file do you double click it? When I do, Silhouette Studio opens and I can then "save as" to my library. I am not an expert by any means but this is what works for me. Hopefully Melissa will get a chance to respond. I have a MAC book pro and click on download and it goes to my download folder. I click to open and it tells me no app I choose "open with" application folder opens and I choose "options" bottom left then "all apps" click on silhouette. then it puts it on the design window. I go to "file" "save as" then either I choose a folder I have on my desktop or "my library". Hope that helps. Quiero manifestarles que Los Tutoriales que ustedes me envían, me son de gran ayuda, lo único es que el Inglés me cuesta entender más. Hace un tiempo yo quitaba Suscribir y automático me salía Traducir y ahora no. Por favor a ver si me pueden solucionar este asunto. Muchas gracias y Dios les bendiga. Thank you for sharing this great file!